NOTE: These processes can be used for multiple types of storage hardware including hard disks, Sold State Drives (SSDs), SD cards or USB sticks/flash drives. NOTE: Remember to de-authorise/deactivate any software/services on the drive if it was used as a system disk. NOTE: If you know of any other Macintosh software that requires activation please contact us. If you are not formatting an internal hard disk or SSD, connect or insert your storage device now. NOTE: If you are setting up an SD card or USB stick/flash drive as a boot drive or external installation device follow the instructions under "To Partition A Device" below. NOTE: USB boot drives or USB external installation devices only work on Intel Macs. 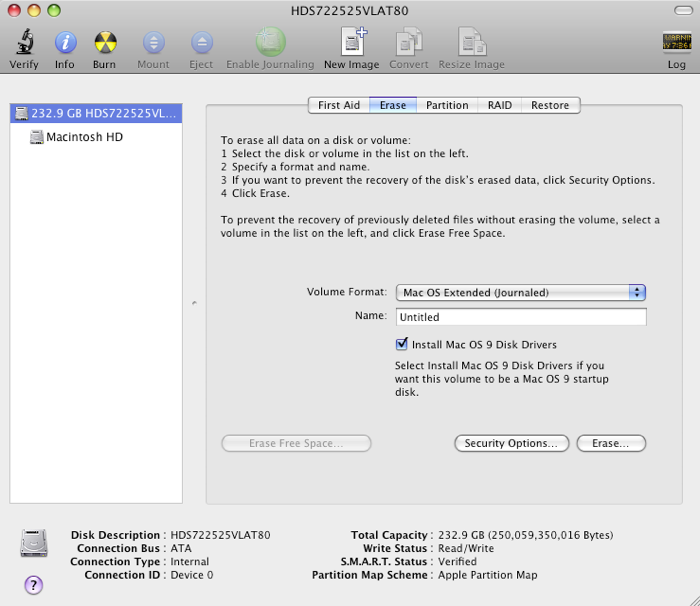 NOTE: Special information on using drives that are larger than 2TB. NOTE: Special information on using Advanced Format Technology (AFT) drives. 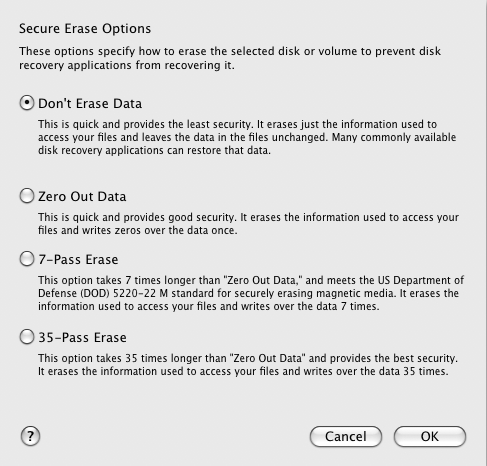 NOTE: with OS X 10.11 or later you can only erase a volume. On the right click on the "Erase" tab. Enter the "Name" for your volume (if it's your main boot disk it's usually "Macintosh HD"). If you have a PowerPC Mac running Mac OS X 10.4 or earlier that is capable of booting Mac OS 9 and you still want to be able to boot into Mac OS 9 tick the "Install Mac OS 9 Drivers" option. NOTE: We do not currently recommend securely erasing an SSD! If you're erasing a device and have a PowerPC Mac running Mac OS X 10.4 or earlier that is capable of booting Mac OS 9 and you still want to be able to boot into Mac OS 9 tick the "Install Mac OS 9 Drivers" option. Click the "Security Options…" button. Choose your desired level of security for the erase. NOTE: Securely erasing a volume can take a HUGE amount of time with the large storage capacities that are now available i.e. many hours if not actual days! Click OK and then "Erase…". On the left select the device that you want to format. On the right click on the "Partition" tab. Select "1 Partition" from the 'Volume Scheme' pop-up menu - in OS X 10.11 or later you can set the number of partitions you want using the + and - buttons (use the - button to change it to 1 partition). On the left select the device that you want to partition. Select your desired number of partitions (volumes) from the 'Volume Scheme' pop-up menu - in OS X 10.11 or later you can set the number of partitions you want using the + and - buttons. 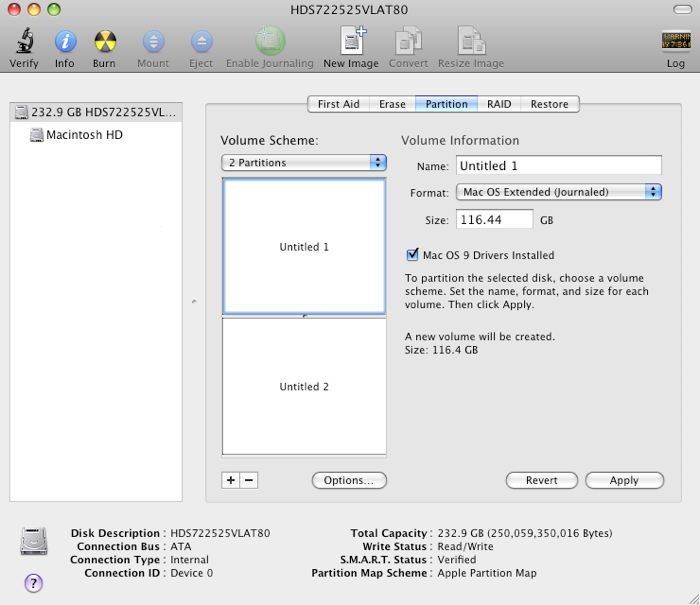 Enter the "Name" for each partition or volume (if it's your main boot partition it's usually named "Macintosh HD"). 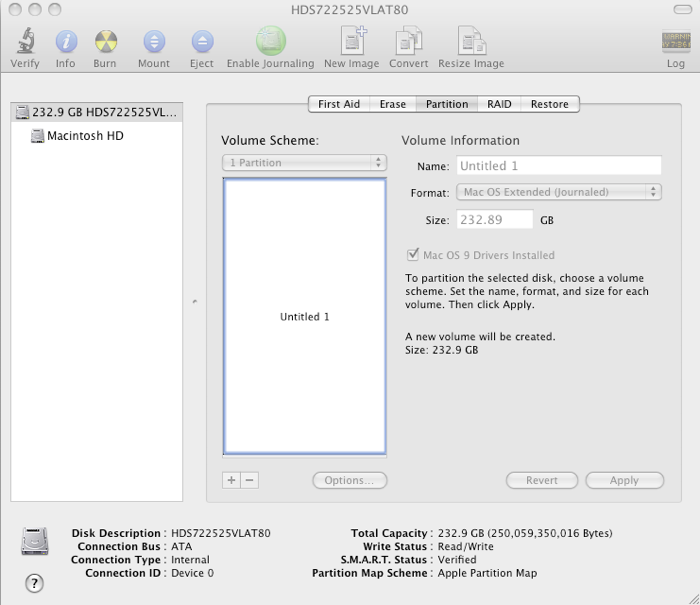 NOTE: Partition schemes are only available with Disk Utility on later versions of Mac OS X e.g. Mac OS X 10.4 or later. not as a boot disk select "Apple Partition Map". 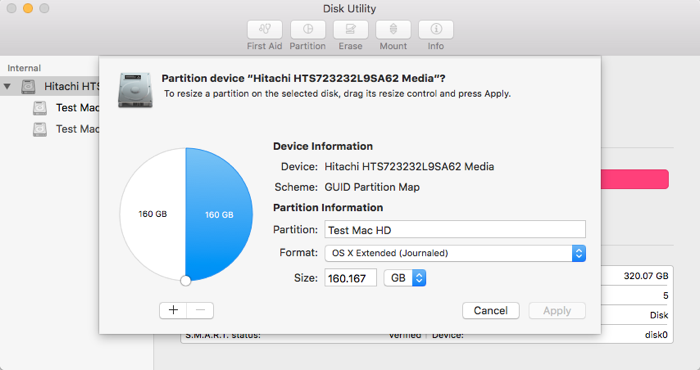 not as a boot disk but only on Mac OS X 10.4 or later select "GUID Partition Table". 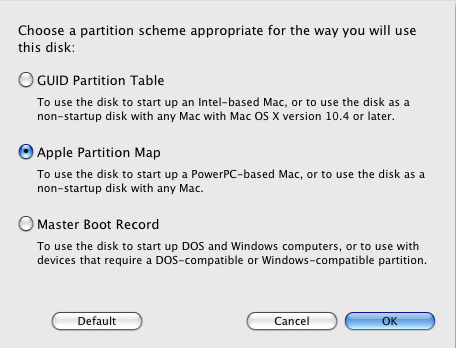 as a boot disk but only on Mac OS X 10.3 or earlier select "Apple Partition Map". as a boot disk on a PowerPC (G3, G4, G5) Mac select "Apple Partition Map". as a boot disk but only on an Intel Mac select "GUID Partition Table". as a boot disk but for both PowerPC and Intel Macs select "Apple Partition Map" e.g for an Emergency Boot Disk. as a boot disk but only for Windows select "Master Boot Record". as a boot disk and it is an SD Card or USB stick/flash drive select "GUID Partition Table". Click OK and then "Apply".